Figuring out your daily protein requirement is important for staying in top physical condition. Without enough protein my muscles will lose the mass that I've worked so hard to build, especially with the level of weight training that I do. And losing muscle, or not building it as fast as you might otherwise build it, is painful and frustrating. But by simply figuring out your protein requirements with the protein calculator below, you can make progress much more easily. And easy progress is a hell of a lot of fun! 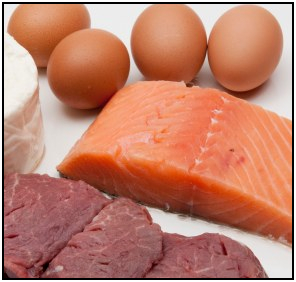 Protein is made up of amino acids, eight of which are considered essential because your body cannot create them. You must eat them regularly. In your body, protein is used mainly to maintain and repair your muscles and other organs. Thus, everybody needs some to stay in good physical condition, but athletes require more than other people. And, contrary to what you may hear, protein is NOT the major source of energy for exercise. Fats and carbohydrates are far superior for pure fuel. Sedentary people need about 0.8 grams of protein per kilogram of body weight, per day, to stay healthy. Endurance athletes need slightly more, 1.2 - 1.4 g protein per kg of body weight per day, and strength athletes who focus specifically on muscle development need the most (1.6 - 1.7 g protein/kg per day). Another fact about protein is that there's really no benefit to consuming more than these amounts. Your body won't be able to use them to build muscle, and they will just get used (inefficiently) for fuel - or excreted. There are many reasons that high protein diets have become popular, both for losing weight and for gaining muscle. On the muscle building end, high protein means that you don't have to worry about not getting your daily protein requirement. High protein diets are very satiating. You feel more full eating protein than eating carbohydrates.Fats have a similarly satisfying effect, but they are much more calorie-dense than proteins: 9 calories per gram for fat, as opposed to 4 calories per gram for protein. Which means that you can eat over twice the volume of protein as fat for the same calories - that'll definitely make you feel more full! High protein diets can be really hard on your liver over a long period of time. Though this is only a problem if you're on the diet for years and years. Also, since a lot of protein is dead animals who are high up on the food chain, they tend to concentrate toxins in the environment. A textbook example of this is tuna, which generally has a high mercury content. I make sure to get organic, grass-fed beef whenever I can and I don't eat a lot of the big fish. Go organic, sustainable, and hopelessly hippie with your meat. This protects me from the bulk of the dangers associated with a high protein diet, and allows me to eat my delicious meats. Why do I eat a relatively high protein diet? I like the taste of dead animals. They are delicious!!!!!!! …And it supports me to do strength training and be really active. Whether or not you decide to eat a high protein diet, make sure that you get your daily protein requirement. You'll build muscle that way, stay strong - and get stronger! • Click here to leave 'Your Daily Protein Requirement Calculator' & go back to the Home-page!